The English and Spanish Language Sony Cyber-shot DSC-TX10 user manual / operating instructions (Sony calls it the “Cyber-shot DSC-TX10 Digital Still Camera / Instruction Manual”) is now online and available for download at Sony.com (right-click and save the user guide to your hard drive). If the download link for the Sony TX10 user manual didn’t work for you, go to the Sony eSupport — DSC-TX10 — Manuals / Specs / Warranty and manually locate the link titled “Instruction Manual”. Unlike with Nikon, Sony allows you to freely print the TX10 owner’s handbook without building in any password protection into the PDF. 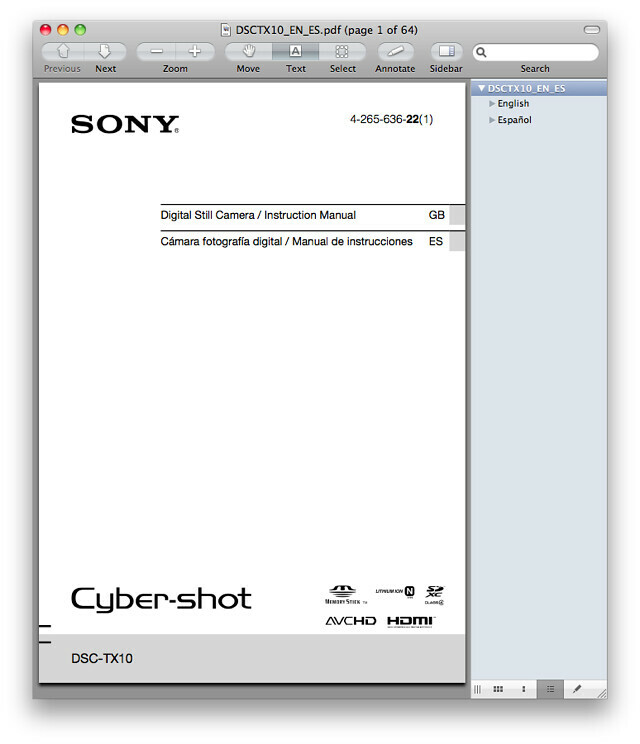 The file size of 64-page Sony TX10 Adobe Acrobat PDF document is 3.4 MB (megabytes). The guide discusses the features of the Cybershot DSC-TX10 and how to use the camera. Pages 16 to 17: Proper insertion, use and removal of SD, SDHC or the latest SDXC memory cards. Page 11, 23 and 28: You’ll need a cable with a HDMI Mini connector on the end that connects to the TX10 in order to view high-quality movies and photos from the camera on HDTV sets. At the time of writing, Sony did not provide a download link for the more advanced “Cyber-shot User Guide / Handbook” which can be found on the CD-ROM that comes with the camera. If you’re purchasing the TX10 as a used item, be sure to inquire from the seller as to whether the CD-ROM is included in the package. 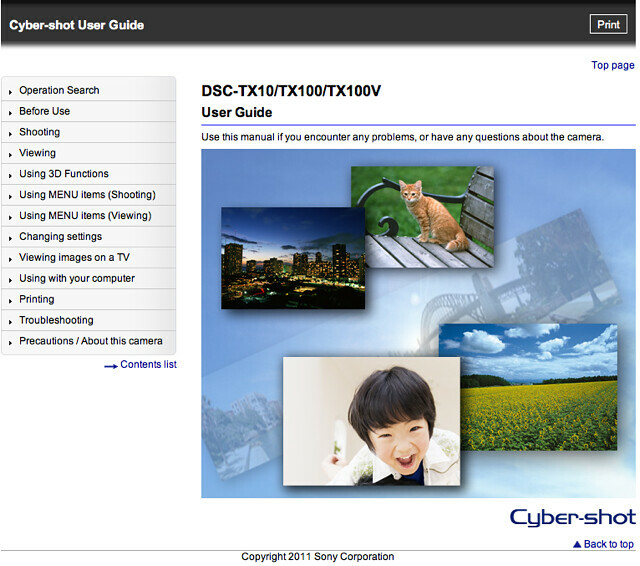 The Cyber-shot User Guide is however, available online at DSC-TX10/TX100/TX100V | Cyber-shot User Guide. Popular Sony TX10 books and other printed literature and reading material in the Arts & Photography and Books section on Amazon.com. Visit Sony TX10 for reviews, tips, tricks, techniques, resources and other helpful information.